Nothing but sunshine and flowers in the forecast! Enjoy the bright feeling of a summer afternoon in this cool cotton top, big flowers of unique eyelash embroidery bringing new dimensions. Side ties can be tied or hang free. One-button opening in back. Approx. 22" long. Imported. Cotton; hand wash. Sizes S-XL. 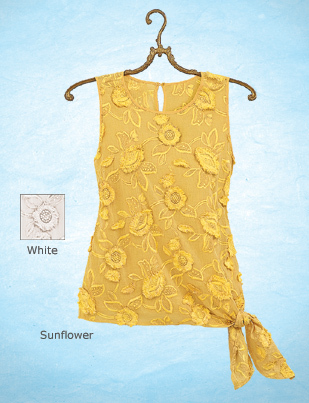 In Sunflower Yellow or White.